I’m Elena — New York & London-based writer inspired by people, places, pugs and kisses. I lived in London for several years, and now, thanks to a man I call Stretch, I split my time between New York and London. My blog is part travel (wanderings), part thoughts (ponderings) and part things that excite me in my everyday dual existence (lovings). I am always looking for the meaning of life. My eternally glass half-full NY dentist Dr Iott, my wiseman London therapist Shomit Mitter and Jane Fonda are just a few of my trusted sources. And obviously, the NYT’s Modern Love column is my bible. This week’s column: “The secret to getting married is not getting married.” Why isn’t that on the front page? Or “For 13 Days I Believed Him” – talk about a headline gripper. My friend Lauren says you can pick a career by seeing which section of the paper you reach for first. She goes for Real Estate, my mother goes for Obituaries, I go for Love. The NYT’s Styles section is bliss. Beyond Modern Love, Styles has the Vows section. I get engrossed reading about complete strangers, how they met in unlikely circumstances and fell in love. I’m always wondering – would the NYT take my story? Then again, I’m not married. But the circumstances under which Stretch and I met are unusual. Maybe the NYT should start a “Love Stories of the Ringless Couples” column. Full disclosure: My blog will go off on tangents, but I’ll try and stay focused. I also love to take photographs, sometimes relying on my lanky photographic assistant to get those above-the-crowd shots. I’m better snapping the ant hills. Often my lens stretches to the countryside or trips away. But New York and London are my hunting grounds, and that’s where I’ll be exploring most. The lovings section is for everything not related to my travel or musings. Books, films, shops, podcasts, you name it, and the people behind them. For example, my morning cappuccino always tastes better if I’m listening to The Daily with Michael Barbaro. I am in lovings with Barbaro’s intimate, and original way of approaching a top story. Within 8 months of its January 2017 launch, The Daily had garnered close to 4 million listeners, me being one. For those with short attention spans, it’s only twenty minutes. I was born and raised in foggy San Francisco, a city I love flying back to – to see how it hasn’t changed at all, and then in some ways has done a full 360. Wanderlust led me to New York in the eighties and then London, the ideal hub for those who like to jump ship every so often and go exploring. When I’m not reading and writing, I’m on the move, seeing things. I have an MA in Journalism from Columbia University and an MA with Distinction in Creative Writing from Kingston University. I think I won sympathy votes for my memoir thesis “Table for Two: Finding Mr Wrong.” I am on the board of Columbia Journalism School and head their Reunion Committee. I’m not a perennial student although I am perennially curious. Who I idolize as a grownup: Too many to name, but honest and funny writers like Nora Ephron, Anne Lamott, Anna Quindlen, Carrie Fisher, Pamela Druckerman are right up there. I wish I could write like Melinda Stevens, editor of British Conde Nast Traveller. Her “Letter from the Editor” page is so her and beautifully written, often nothing to do with travel. Last month’s issue was all about how she met her husband. Pet hates: Thoughtless people, bullies, olives, meatloaf, tasteless, lukewarm coffee and runny eggs. And obviously, any form of scary animal including cats who sense my fear and cosy on up. Pet loves: People who ask me how I am. And mean it. 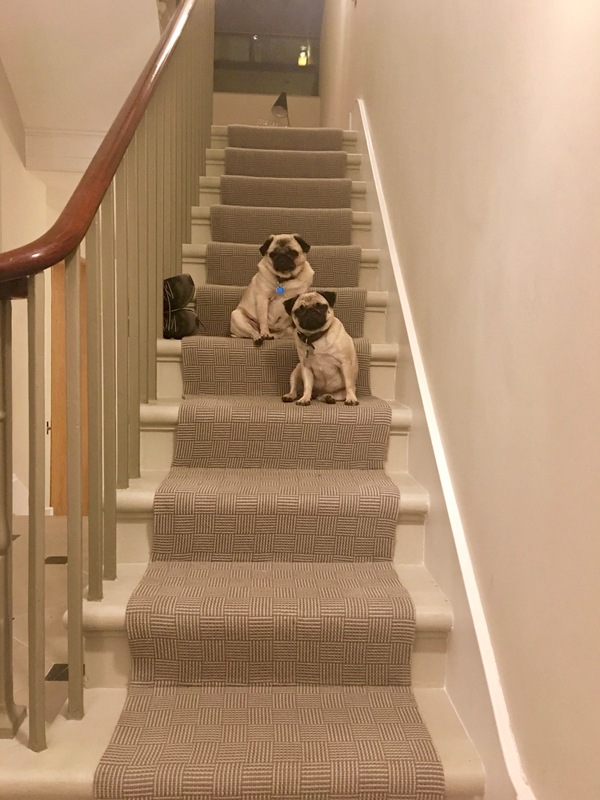 And although they never ask me how I’m doing, I still adore them – my pugs, Antoinette and Josephine. They hold zero resentment, only wagging tails. A life lesson. I’d love to hear from you. Send me a message!